While each spiritual awakening in history has had its unique qualities, they all have had one feature in common: they all began with God's people uniting in desperate, humble, and expectant prayer. And not just ordinary prayer, but extraordinary prayer specifically for revival of the church and spiritual awakening of our culture. 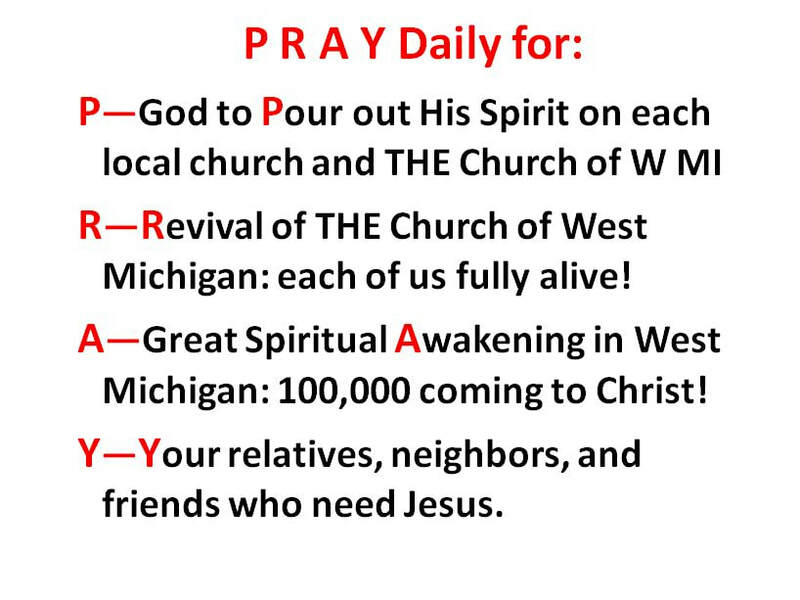 We long to see more and more people joining us in praying for God to revive us, the Church of West Michigan, leading to--in His sovereignty--a mighty Awakening that brings hundreds of thousands of people to a saving knowledge of Jesus Christ. ​For a listing of places where we will be praying over the next few months ​​click here. On this one day, Thursday, May 2nd at 7 pm, we have the opportunity to come together as One Church in prayer. Throughout the evening there will be Prayers of Praise and Repentance, and Prayers of Petition for: (1) Unity in the Church (2) Reaching the Lost (3) Government (4) Family, and (5) Social Issues. Join the effort to bring 24/7/365 Prayer to West Michigan!! We are working with a number of church leaders and others to do in West Michigan what has been positively transforming so many other communities in the U.S.: 24/7 prayer! Learn more by going here. ​JOIN THE WEST MICHIGAN PRAYER TEAM TO PRAY FOR REVIVAL AND SPIRITUAL AWAKENING!